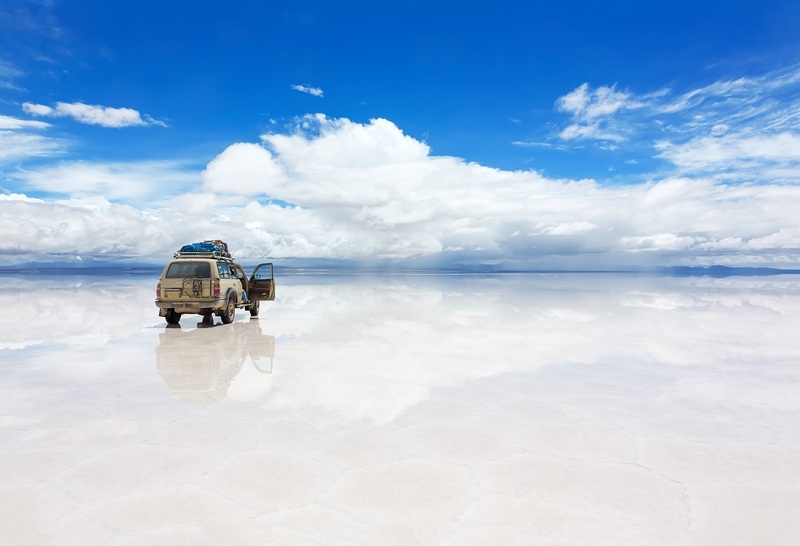 The Bolivian Salt Flats are one of most mysterious places in the world, and there are many different routes to Uyuni, but which one is the best? 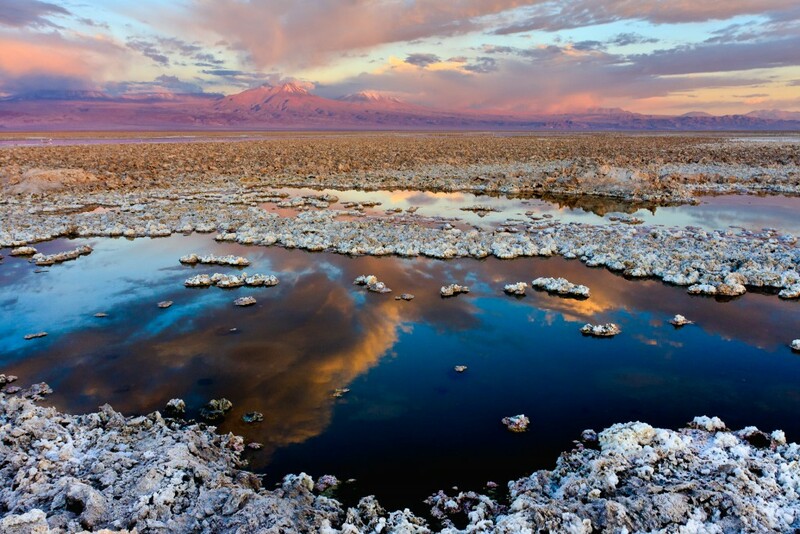 We explore the options of visiting from La Paz, Sucre and the Atacama Desert. The Salar de Uyuni is the most visiting tourist attraction in Bolivia, and is the world’s largest Salt Flat at over 4,000 square miles. The Salt Flats were created when Lake Minchín dried up, leaving a crust of salt meters thick in some places. Over 50% of the world’s lithium is found in the area. The area is the main breeding ground for several species of flamingos, including the James flamingo. 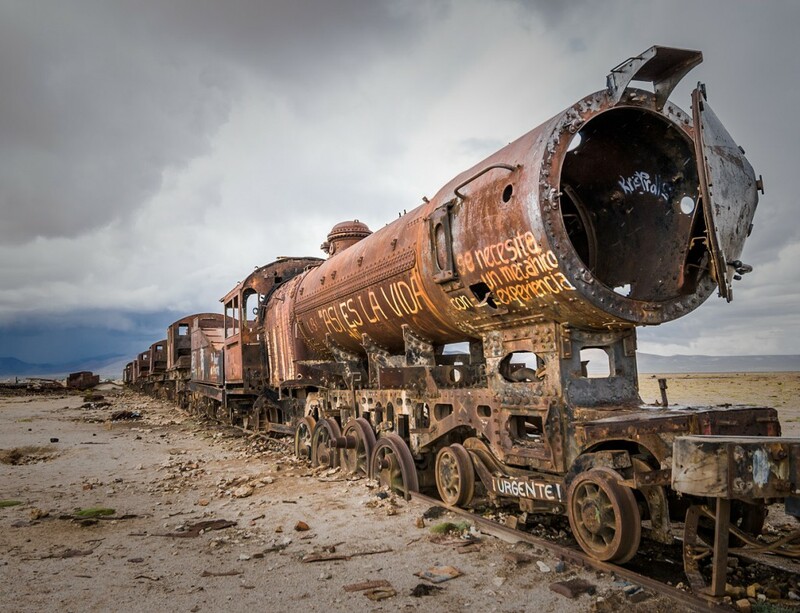 The train graveyard, the hot springs, Isla del Perscado, and the various coloured lakes are some of the highlights, as well as the other-worldy landscape. This is the most popular option for visitors who are short on time, as you can visit Uyuni in a couple of days from La Paz. There are early morning flights with Amaszonas, which take less than an hour and arrive at around 7am. You can begin your tour straight away, and see most of the highlights in that first day. The last flight back to La Paz is at 18:45, so you’d be had pushed to really enjoy the landscapes and make it back to the airport in time. Although this isn’t impossible with a private guide and driver, we would recommend at least two days to really appreciate the Salt Flats. However long you choose to stay, flying remains one of the most popular routes to Uyuni. The roads between La Paz and Uyuni are mostly unsealed and bumpy, making for a very unpleasant 350 miles! However this is the cheapest option for backpackers on a budget, but the trip takes 10 hours and it can get very cold on the bus, which only travels by night. There are also night trains between Uyuni and Oruro, which are slightly more comfortable, but can also get extremely cold. Oruro itself is probably not worth spending much time in, outside of carnival season that is, and the city is quite gritty and rough in places. From Oruro there is a bus that takes you the rest of the 150 miles to La Paz. You can, of course, do this route by private transfer if you prefer, but for the sake of price and convenience we would suggest flying. 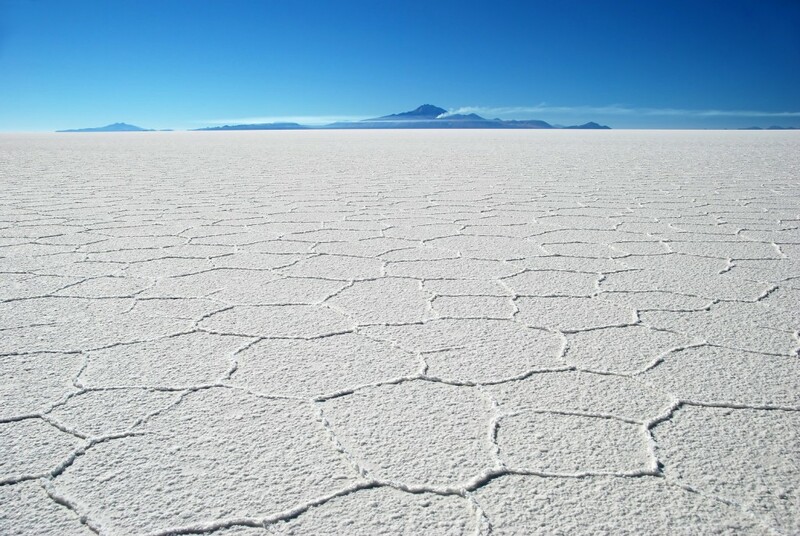 Nevertheless it’s worth mentioning when looking at the different routes to Uyuni. This is probably our preferred route if you have a few days to spare whilst in Bolivia, as you get to stop along the way and see more of the country. Sucre itself is a beautiful city of colonial buildings and cobbled streets, offering a contrast to the chaos of La Paz, and we highly recommend spending a day or two there. 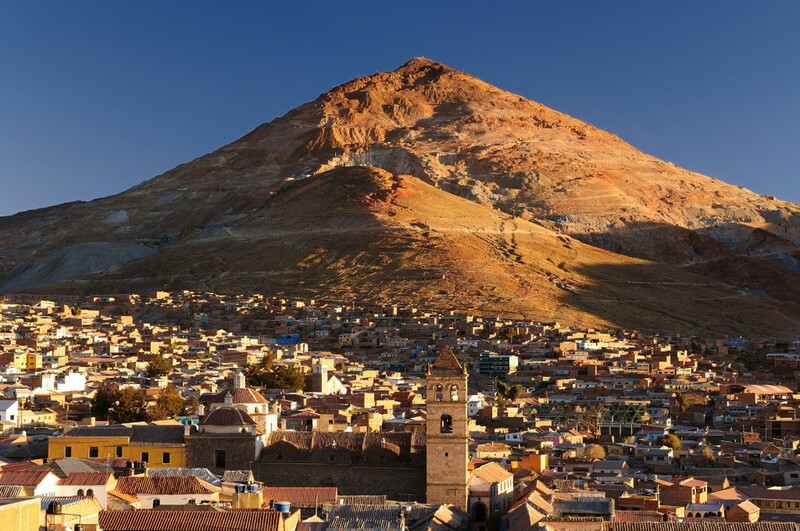 The distance between Sucre and Potosi is only about 100 miles, so you would have plenty of time to explore this old silver mining town before driving the rest of the way to Uyuni (about another 130 miles). After exploring the Salt Flats you can then either fly back to La Paz, or get either of the overland options mentioned above. 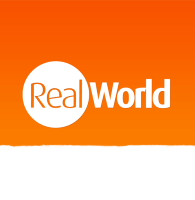 You can travel to Uyuni by any of the options suggested above, and spend the first day exploring the Salt Flats and Isla Pescado, staying overnight in Uyuni. On the second day you will continue your journey by 4×4, driving much further into the vastness of the Altiplano than most tourists ever go. 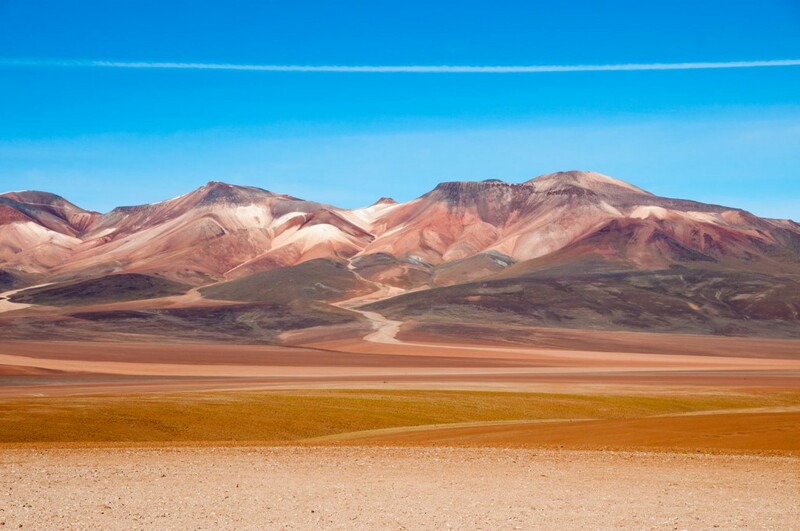 You will have the chance to visit geothermal fields, geysers and lagoons, and you will see how the scenery changes the closer you get to Hito Cajón, the border crossing between Bolivia and Chile. From here you will head to San Pedro de Atacama, which is a good base for exploring the Atacama Desert. This itinerary can be done in both directions, and is a good option for those wishing to combine the two countries. 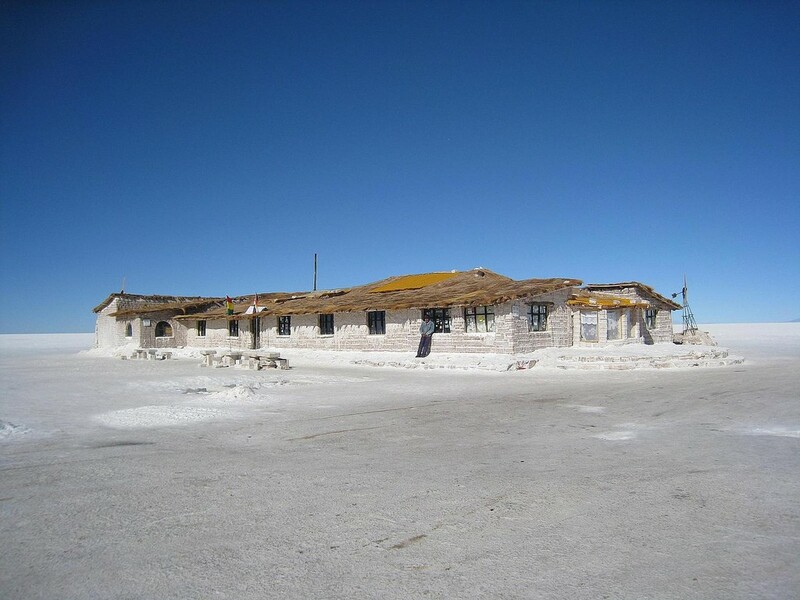 A Salt Hotel There are a number of hotels in Uyuni made almost entirely of salt, including the Palacio de Sal and the Hotel de Sal Luna Salada. Although they are rustic and fairly basic, they offer the best accommodation in the area, and are a novelty for a night or two. An Airstream Caravan If you want to spend a night out on the Salt Flats, the best option is booking a tour which includes a stay in an airstream trailer. The benefit of this option is that you get to see the sunset and stargaze in the pitch black skies, however these tours tend to be expensive. Camping on the Salt Flats A cheaper option if you want to sleep on the Salt Flats is to book a ‘glamping’ tour, staying in tents beside the Thunupa Volcano. Just be aware that temperatures plummet at night, so it often gets quite cold, even inside the heated tents. 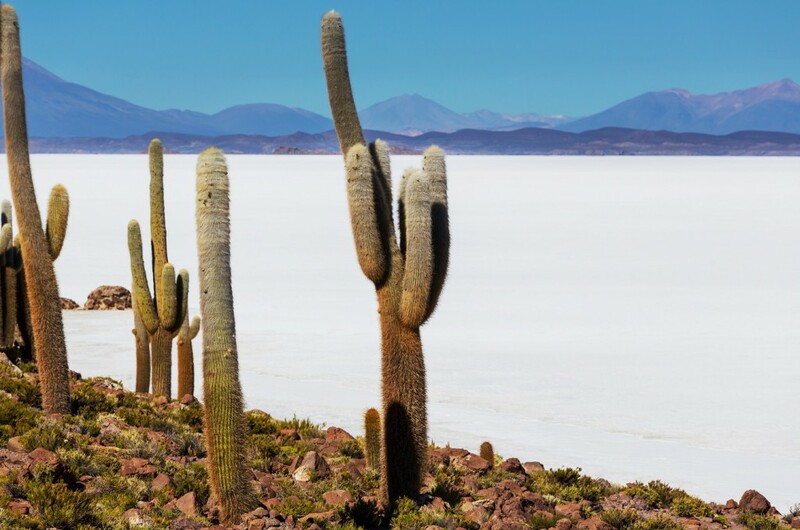 There are plenty of low cost daily flights between La Paz and Uyuni, so there’s no reason why you can’t incorporate a visit to the Salt Flats into a longer itinerary in South America. If you desperately want to visit Uyuni but are short on time or don’t think it will fit in with the rest of your itinerary, enquire about a tailor-made holiday.